Description: Silver crown, silver and green cap. Black text: Hahn, white text: Premium LIGHT TWIST OFF ONLY and arrow. In the back black text: Q. 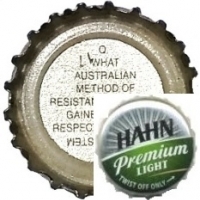 WHAT AUSTRALIAN METHOD OF RESISTANCE TRINING GAINED GLOBAL RESPECT IN THE 90S? A. MATRIX SYSTEM.